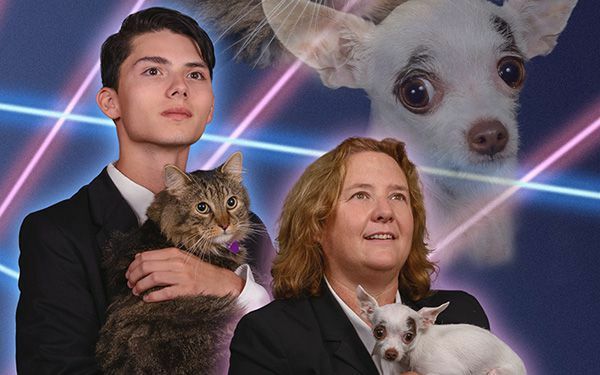 A teenager and his cat, a principal and her dog, and lasers. They all came together in Draven Rodriguez's senior portrait. It ended up with him holding his cat, Mr. Bigglesworth, and Schenectady High School Principal Diane Wilkinson holding her Chihuahua, Vivienne. 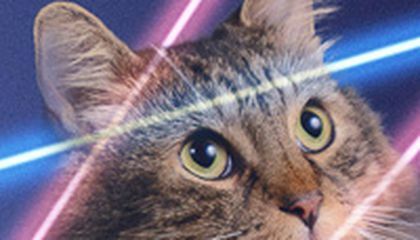 The 16-year-old had originally wanted his senior yearbook portrait to show him holding his cat, with lasers in the background. He posted the photo on the Internet. It went viral. The school denied his request but said the photo could appear somewhere else in the yearbook. Then Wilkinson got in on the act. Now school district officials say the portrait with the two pet owners will appear on the principal's yearbook page. The joint portrait will be used to raise awareness for the American Society for the Prevention of Cruelty to Animals and rescue animals. Critical thinking challenge: If wanted to raise awareness for a worthy cause, how would you do it, what cause would you pick and why? This story is about a senor in high school who wants to have his cat in his school photo with him. He also wants lasers in the photo. He asked the principal if he could have hs cat in his year book photo. She ended up saying no but she said he could have it in another part of the year book to raise awareness about animal cruelty. If could raise awareness about something it would be global warming I would start a campaign to encourage carpooling. I think it was a good idea to have his photo in the year book to encourage awareness. Great picture!!! The dog and cat's expressions are so funny! I think its good they are raising awareness for the American Society for the Prevention of Cruelty to Animals and rescue animals too. I get the raise weariness for animal cruelty, but a photo in yearbook with his cat now that is just weird. Ya I'm a animal lover but that just a bit over the top. What I think they should do to raise money for the cause, is to have people pay to have their animal in their yearbook photo with them. I understand where they were coming from but it kind of turned out weird. I mean, raising awareness for animal cruelty is awesome, and yeah I'm an animal lover but this picture just looks kind of weird. I think that would be cool to have you and your pet in the yearbook right there next to you. I would want that but with my little bunny. That is so cool I wish that I could do that I love animals so much I am glad the 16 year old got to do this hopefully it will help stop animal abuse. This is absolutely hilarious! The expressions on the animals are just fantastic and the way the owners are just casually holding them is almost to good! I love how there raising awareness and its a good idea. There doing a really good thing and I think there doing awesome. Hopefully this gets trending # derpy kitten lasers! I like the picture, were did you get the laser back ground. I want to take a picture and share it with my family. I love the way the animals faces are showing in the background. Were do you take the picture.Are those real lasers if they are how are you not sweating.